This chic business hotel enjoys a prime situation in the heart of Kowloon East – Kwun Tong, a newly developed commercial hub in Hong Kong. It is a short walking distance from the MTR station and provides easy access to a wide choice of nearby shopping and dining opportunities. Ideal either for a business or a leisure stay, this outstanding hotel offers a large choice of rooms and suites equipped with the latest technology and the best bedding arrangements to guarantee guests enjoy a restful night sleep and a comfortable stay. The onsite restaurant offers a hearty breakfast ideal to have a good start of the day, and those travelling for business purposes can take advantage of the completely equipped business centre. There’s a nature-inspired outdoor pool surrounded by comfortable sun loungers so guests can relax enjoying the sun or rest under the magnificent urban landscape. 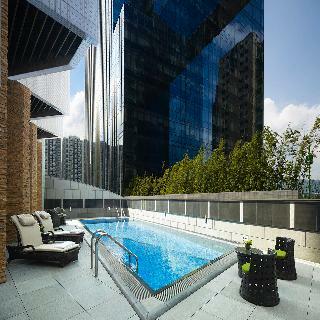 Set in the heart of Hong Kong's Kwun Tong district, this modern and luxurious hotel provides business travellers with easy access to the district's commercial and industrial areas, as well as access to the bustling city centre and its famous attractions for leisure travellers. The Kwun Tong pier is just a short walk from the hotel and the Eastern Harbour Tunnel is only 5 minutes away, connecting drivers to Hong Kong Island.The hotel's elegant guest rooms feature an array of modern conveniences such as iPads for guest use, a pillow menu, and complimentary minibars. Guests can enjoy a romantic meal or quick business lunch in the ultramodern onsite restaurant offering both Japanese and Italian cuisines, and business travellers can hold an original networking or social event on the eco-chic terrace. 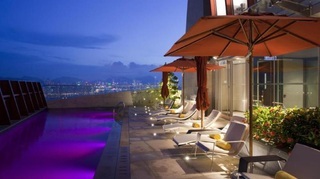 The hotel also boasts a stylish rooftop pool and state-of-the-art gym, both with magnificent views over the city. Located in Kowloon Kwun Tong, one of the oldest industrial areas in Hong Kong, the hotel is placed just 5 km from the city centre and is 45 km from the airport.Offering a host of amenities, this 598-room air-conditioned city hotel is a perfect venue for a pleasant as well as relaxing stay.The hotel features elegant guest rooms that are air-conditioned and facilitated with an array of contemporary amenities. Most of the rooms overlook the runway of old Kai Tak Airport and Hong Kong Island. In-room amenities include a private bathroom, TV, minibar, tea and coffee making facilities and centrally regulated air conditioning units.A buffet breakfast is served each morning at the hotel. Newly opened on Dec 2018. Room Size 20 sq meter , hotel offer FREE buffet breakfast and FREE WIFI. 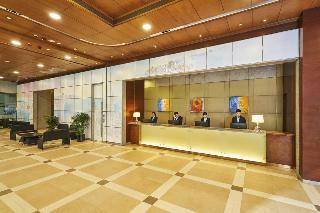 Holiday Inn Express Hong Kong Kowloon CBD2 is conveniently located at Kwun Tong with 5 minutes walk to MTR station. We are in the center of CBD2, within walking distance to Landmark East, Millennium City Complex and apm – one of the biggest shopping mall in East Kowloon. Other self-service facilities such as Great Room with computers, self-service laundry and dry-cleaning and vending machine.Business or pleasure, Holiday Inn Express Hong Kong Kowloon CBD2 is the perfect choice to stay smart for your visit to Hong Kong.